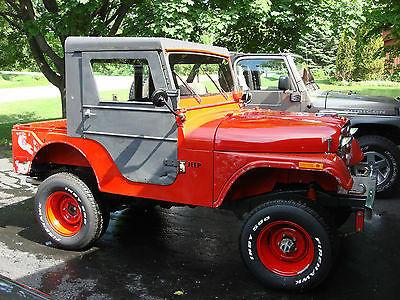 Selling a 1971 Jeep CJ-5. The last year of the short wheel base. Comes with a period correct half hardtop and steel doors with roll up windows. This Jeep has had a lot of modifications done to it starting with a Mustang GT 302 V8 engine with an edelbrock carb, aluminum intake, MSD ignition, ford motorsport wires, valve covers and air cleaner. It has an thermostatically controlled electric fan with a aluminum radiator. The motor runs great!! This is mated to a 1974 Ford bronco C4 automatic transmission with a new Lokar shifter and adapted to the Dana 18/20 transfer case via an advanced adapter plate. The axles are original with higher gears in them and I believe they are 4.11's the front axle has manual locking hubs. 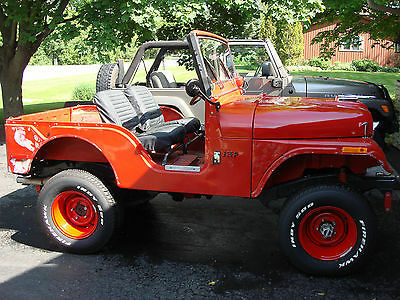 The jeep has power steering and manual brakes and both work very well. I removed the heater assembly as I was only driving it in the summer. It will go with the Jeep sale as long as I can put my hands on it, forgot where it got to. It has a new Flaming River keyed tilt column with a mahagonny steering wheel. The wiring is a painless wiring system that needs some finishing. Some of the gauges are working and some do not so that will need attention too. The seats are original with bestop seat covers on them. There is 4" racing seat belts as well. There is no rear seat. 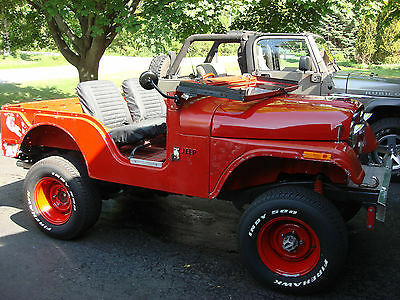 This jeep has the factory roll bar too but it is not pictured. The rims and tires as you can see are great. The rims are actual vintage steel rims that were professionally modified to make them 8" wide then they were powder coated red. The tires are new with only 100 miles maybe on them and they are Firestone Indy 500 performance tires. The body of the jeep is in great shape with surface issues only. Paint stinks but adds to it. There is no rust thru, The pictures of the floor are deceptive, what you are seeing is actually glue that was used to hold down some indoor out door carpet that I removed. Lastly the jeep runs and drives but there is a mild vibration that I believe is coming from the transfer case and could be u-joints but i haven't had it checked so I am not absolutely certain. This jeep can be driven for a test drive if you are so inclined. I am selling this to help fund another project. Please Please ask questions. This jeep was sold to a guy that never asked questions up front and decided he was going to take his anger of EBay out on me by not paying. This is a great vehicle with a little TLC will make a cool ride. 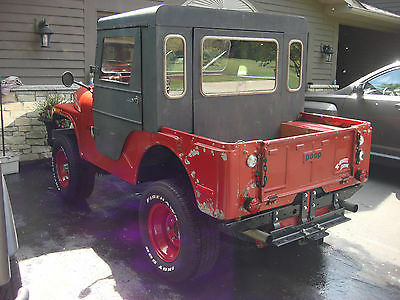 Thanks for looking!I am more than willing to help set up transport for the Jeep when purchased.